Fun Math Board Games To Teach Kids Math. "A Fun Way to Learn Math"
Math Board Games are a really fun way of getting the kids engaged and learning math at the same time. Think about it for a second. Most of us (even us older heads) while growing up have loved playing board games. On this site we've created several board games that have been used by teachers and parents around the world. 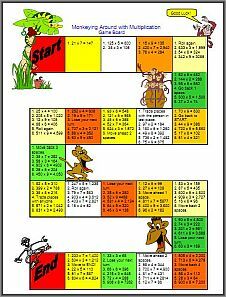 Monkey Multiplication: Fun board game for kids working on multiplying 2 and 3 digit numbers by 1 digit numbers. All you need for this board games is a single die and game piece for each player. Clink on the link above to print off the game board. It's a good idea to laminate the game board so the kids can play over and over again. Driving Into Division: Here's a division board activity students can practice dividing numbers. Division of 3 and 4-digit numbers by 1 and 2-digit numbers. Ready for this next game. Students can really have a good time building division skills with this game. Just like the previous game, you can begin by clicking on the link to head over to the game page. Once there you can take a look over the directions and then just print off the game board. We all probably had some personal favorites at one time or another. Do you remember any of the classics? Candyland, Monopoly, Scrabble, Clue, Sorry, ... and the list goes on and on. So what does this all have to do with math? Well, some of these classic board games that kids have loved for generations, are very math-friendly and great tools that parents and teachers can use to help reinforce math concepts! Who could forget about Connect Four, Battleship, and the list goes on. Also a host of newer board games that have come on the scene in recent years that you’re probably not familiar with that go hand in hand with learning and practicing math concepts. A game that I would have loved, but wasn’t around when I was a kid was the 24 math game. 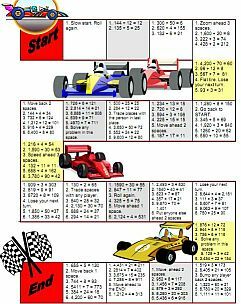 This page of the site is our way of helping keep you in the know about great math board games both past, present, and future, that you should definitely add to you tool box when helping kids learn math. We will give you our tested and honest review of the games. How about creating your own math board game for home or having your students create math games for the classroom. Are there any favorite board games utilizing math you think our visitors might enjoy trying? Please share your favorite/s.